32/47 Amanda Jones Pretty enough, but devoid of story and paced too unevenly to hold my interest. 39/52 Les Winan Surprisingly slight given the incredible set and costume design. I know what it's about, just not what it's about. 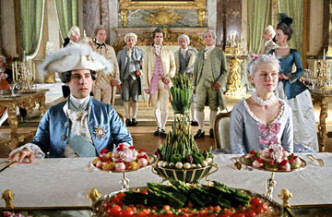 44/159 David Mumpower Spirited take on the lifestyle of a royal is a bit melodramatic at times, but Kirsten Dunst is impossibly winning. And the I Want Candy scene is grrrreat. 54/68 Michael Bentley The colorful New Wave look and sound can't save it from Dunst, or from being unengaging and uninspired. 179/200 Max Braden Pretty, but absolutely pointless. Sofia, what gives? Marie Antoinette actually never said that. She was, however, a virulently despised figure by the radicals of the French Revolution. The legendary queen and youngest daughter of Holy Roman Emperor Francis I was born in Vienna on November 2, 1755. Fifteen years later, she had married the crown prince of France and became queen when her husband was crowned King Louis XVI four years later. She was a mere 19-years-old. The beautiful queen was unhappy in her marriage, though. Louis was homely and awkward, and his devotion to hunting and his workshop stood in stark opposition to her love of the arts, fashion and dance. Though everyone recognized that Marie was a great beauty, Louis was shy with his affections and failed to give her the attention she craved. Their marriage actually went unconsummated for seven years. Louis' impotence turned out to be the result of a medical condition, and he finally had surgery to aid him with the problem. In the meantime, Marie Antoinette suffered snide remarks and taunts about her inability to produce an heir to the throne. Her difficulties with her husband were not all that ailed her. Marie Antoinette was bored with the public duties required of her and became wry and sarcastic as a result. Still, as time went by, she began to exercise all the power that being queen embodied. She was completely extravagant and traveled in social circles of the greatest frivolity and indiscretion. Rumor had it that she was having an affair. Her beauty was such that fashion was one of her greatest pursuits. She spent ridiculous amounts of money to stay clothed in the highest fashion of the day. Her excess went so far that she became an object of ridicule. After numerous scandals and the eventual downfall of the monarchy, Marie Antoinette was sentenced to death. She was beheaded at the guillotine on October 16, 1793. See the latest developments for this project on the Marie Antoinette Movie News page.